Our corporate partners are crucial in helping us to deliver life-changing care for patients at the RHN. The money that you raise as a corporate partner will help us to directly fund specialist services and develop advances in care that will make a vital difference to the quality of life experienced by people living with a range of neuro-disabilities. As a Corporate Partner you can be confident that the money you raise or donate will be used to support our patients and residents in the best ways possible. Whether you choose us as your ‘Charity of the Year’ and raise funds during the course of twelve months, make a one-off donation or sponsor an event, when it comes to seeing the results of your support, you can be as involved as you wish. Our relationship with Capsticks is a great example of one of our wonderful, long-term, corporate partners. Each year they fund the ongoing running costs of our onsite computer room. This room enables patients to use specialist/assistive technology that helps them communicate with the outside world. Every year we rely on Capsticks’ generosity to keep this invaluable service running. We also have some corporate social responsibility (CSR) opportunities during the year, so we can work together to find an opportunity to suit your team. As a Corporate Partner you will hear about all new events first, you might even want to become an event sponsor. 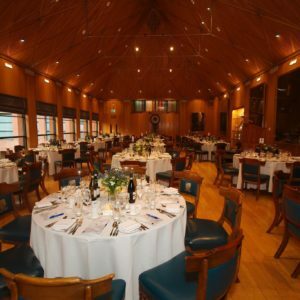 Many of our events are the perfect opportunity to engage your team (sponsored walks, runs or challenge events), or they can be a perfect reward for your employees hard work, for example our gala dinner. Following two successful gala dinners in 2015 and 2016, our next dinner on Thursday 11 May 2017 is set to be another hugely popular event. Held at a different venue each year, this one will be held at the stunning Goldsmiths’ Livery Hall in Central London. Tables will seat 10 guests and cost approximately £1,250, this includes a champagne reception, three course meal, and wine. Tables are not yet on sale, but you can register your interest by emailing events@rhn.org.uk. Get in touch today to find out more about becoming a partner and discuss the opportunities available to you. Call the Fundraising team on 020 8780 4565 or email corporate@rhn.org.uk.